An ode to hilarity, kindred spirits, and weird haircuts. Celebrating the full picture of BFF life, this mug features Sandra Dumais's playful heart illustration that offers a refreshingly honest look into cohort-ism. Sandra hand sketches, paints, and digitally draws a narrative interplay of words and images. The result is an ode to hilarity, kindred spirits, and weird haircuts that makes for a positively charming character study. Mug made in China. Decorated in Edina, Minnesota. Click to view the artwork for Best Friend. Looking for more of the family? 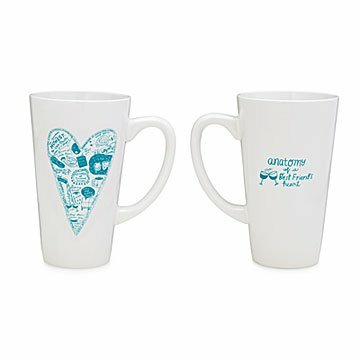 Click to see our Anatomy of a Grandparent's Heart Mug, Anatomy of a Parent's Heart Mug, and Anatomy of a Sister's Heart Mug. My friends and I decided to do a small gift exchange for Christmas, as we're all broke and struggling college students, but who also want to do something nice for their BFFs. We came to a consensus of $20 per person, and these mugs fit perfectly into that budget. I was surprised at how heavy the box was when they came in the mail, and when I took the mugs out to make sure there was no damage from the transit, I was pleasantly surprised with the quality of them. Although I didn't get a mug for myself, I was still very happy with the weight, height, and design of them. The mug for BFFs was adorable and my BFFs were so excited when they opened them! I purchased this for a best friend whom is a nurse. It looks even better in person and we both loved it! A perfect gift for that special friend, the one that sticks with you through thick and thin. This is a beautiful mug and a wonderful way to show someone how much they mean to you. Both of these were gifts and were received with very happy raves. Such a great and sweet gift! She loved it! My friend 'loved' this mug. I would order this mug again. It makes a great gift! My best friend, who I've known since we were toddlers, moved three time zones away. I miss her and her children every day. This was the perfect gift to let her know I think about her every single day.